A wonderful tale for young readers about two devils that fly over the town of Brisk on a Hanukkah night. At one house, the devils turn the children’s dreidels into creatures with arms and legs that begin to dance. At the next house they make the latkes rise from the pan and begin flying around the room. The devils continue to make trouble all over the town. Everyone runs to seek help from the rabbi, a wise and holy man. He is able to turn the tables on the devils and get them to provide Hanukkah gelt (coins) for the children and the poor. The rabbi shows that “Nothing is completely wicked. Sparks of holiness exist in all things. Even in devils and their mischief.” He does this by recognizing what is beautiful and delightful in their tricks and thus making them good. Illustrations. “In the most imaginative Hanukkah book this season, Kimmel peoples an old-world town with mischievous demons, easily alarmed villagers and a wise and crafty rabbi,” writes Publisher’s Weekly in a review. Entry filed under: Publication Highlights. 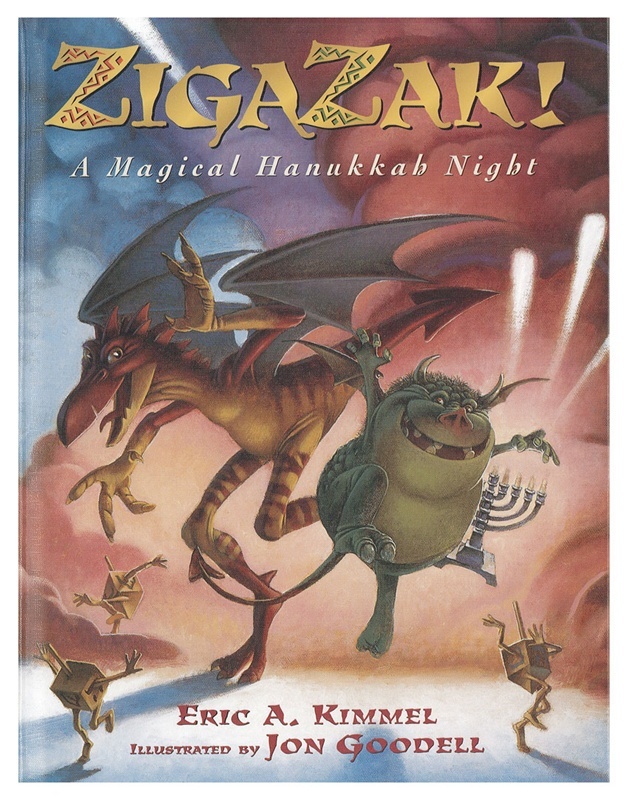 Tags: children's book, demons, devils, Eric Kimmel, hanukkah, jewish, John Goodell, judaism, zigazak.